The AR8200 represented a beacon when first released building on the successful recipe of the AR8000 and technology developed for the award winning AR5000 base receiver. Technology continues to march forward with the AR8200 and the new AR8200-III. The MkIII is also be supplied with 1500 NiMH batteries rather than Nicads. Note should be taken of the comments made in the operating addedum below. One other change is that the backlight can be set to be activated when the squelch opens. Also available on our web site is the AR8200-III operating manual addendum - this addresses changes from the original AR8200 seen in both the AR8200-II and AR8200-III. The AR8200 represented a beacon when first released building on the successful recipe of the AR8000 and technology developed for the award winning AR5000 base receiver. Technology marched forward with the original AR8200 and AR8200 Series 2 owever the AR8200Mk3 keeps the innovative concept and forward thinking of AOR alive and bright. It has not been easy improving on what many thought to be the ultimate, however the AR8200Mk3 provide even more with nothing taken away. The list of features is vast, large multi-section backlit LCD, side mounted navigation keys and rotary tuning control, alpha-numeric text comments. The all important 8.33 kHz airband channel step is correctly implemented (eight-and-one-third, 33, 66, 00). Channel steps are provided in a menu and may be programmed. Step may be programmed by the operator in any receive mode using multiples of 50 Hz in any mode (i.e. 5 kHz, 12.5 kHz or even 1.25 kHz). Extensive step-adjust and frequency offset facilities are also provided (as per AR5000) to ensure tracking of the most obscure band plans, AFC (Automatic Frequency Control) is included for spot on tuning ensuring that nothing is missed. A wide frequency coverage is available from 530 kHz to 2040 MHz (no gaps) with actual minimum acceptable frequency of 100 kHz. The RF front-end is preselected around VHF to ensure the highest levels of adjacent channel rejection with software spurii cancellation. The short wave bands are converted directly to an IF of 45 MHz to remove compromise and the AR8200 SERIES-2 is supplied with a detachable plug in medium wave bar aerial for localised monitoring with a negative feedback circuit employed. All mode receive: WFM, NFM, SFM (Super Narrow FM), WAM, AM, NAM (Wide, standard, Narrow AM), USB, LSB & CW. A 3.0 kHz SSB filter is employed with true carrier re-insertion resulting in non-offset frequency readout for easy tuning of SSB transmissions. An attenuator and noise blanker are also featured. A meaningful band plan is factory programmed specific to market area, this ensures that the AR8200 SERIES-2 automatically selects the correct receive mode and tuning step (although mode and tuning step may be manually selected at any time), the band plan may be edited via computer control. The side keypad provides four arrow keys presented as a single 'rocker' resulting in more natural and intuitive navigation through the on-screen menus. Tuning is accomplished via a variety of controls including a side panel indented main tuning dial, arrow keys and keypad. Flexible dynamic memory bank layout is provided. Memory banks may be varied in size between 10 and 90 channels each i.e. bank 'A' 80 channels / bank 'a' 20 channels with bank 'B' 40 channels / bank 'b' 60 channels etc). 1,000 memories, 20 memory banks, 40 search banks, select scan list, priority and lockout facilities are included. It is also possible to edit and delete individual memories, swap, copy, move and delete whole banks Including dumping all data. The remote socket not only allows computer control but also supports clone of data between two AR8200 along with tape output, detector (discriminator) output, mute and AGC. 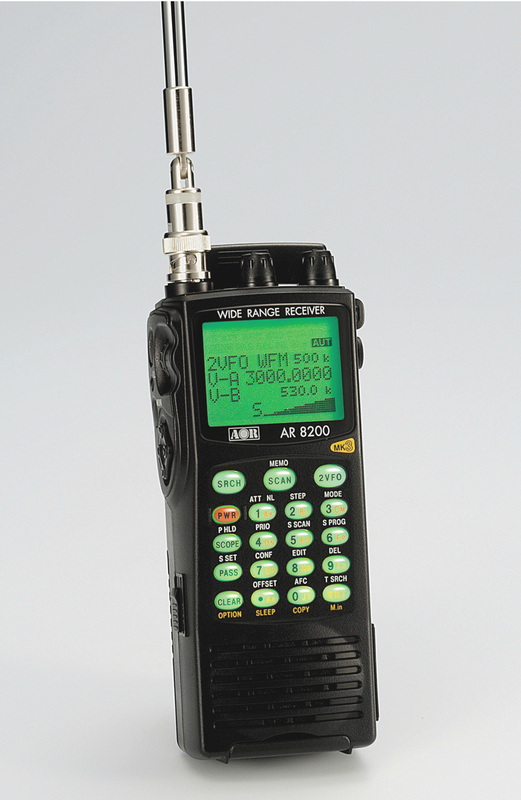 The AR8200 can also be used in conjunction with the Optoelectronics Scout or Watson Super Searcher frequency counters for automatic and instantaneous tuning of any detected frequencies. The optional RT-8200 cable is required. Computer control is available via a metallic side mounted robust connector and optional lead, an extensive RS232 command list is supported. AOR's software package AR8200 Workshop is now available as a Free Download. For those who may wish to write there own software AOR provide in Adobe PDF file format cc8200.pdf which contains all the command codes used by the AR8200 together with additional information. JAV-232: This is one of the most versatile interfaces available offering compatibility not only with the AR8200 but also the AR8000 and many other receivers requiring a TTL convertor. When used with the AR8200 the JAV-232 not only offers computer control but a squelch activated tape switch output and discriminator output. Also available is the 8200PC from AOR. This includes a TTL convertor with a DB-9 connecter. The EM8200 enables the whole 1,000 memory channels in 20 banks and 40 program search banks to be backed up to the EM8200. In fact the EM8200 can hold the entire contents of the AR8200 including environmental operating data and band scope FOUR times in EM8200 locations 0, 1, 2 & 3. It is not necessary to have ALL data, you can specifically choose what data is to be backed up and to which location. The CT8200 enables the AR8200 to search for 50 CTCSS tones which may be in use on the current receive frequency and to save a specific CTCSS tone (from the 50 tones available) into each VFO, each search bank and every memory channel individually. CTCSS is used by may amateur band repeaters, public utilities and private mobile radio services where shared resources are used, CTCSS ensures that operators only hear traffic intended for them. RU-8200 - Record chip slot card The RU8200 enables around 20 seconds of audio to be recorded to a chip within the RU8200 for playback at a later time. The chip may be recorded to time and time again over writing the previous recordings. The recordings may be played back over and over, very useful if you have graded an interesting recording! The RU8200 may be used in VFO, scan, search and memory read modes. The TE8200 enables the AR8200 to ignore certain transmissions which would otherwise stop the scan and search process. Pilot tones are often transmitted by public utilities and railways making their transmissions troublesome and fatiguing to monitor without the use of the TE8200. There are 256 values for the tone eliminator ranging from 0 to 255 representing a frequency range of 0.4 to 4.2 kHz. VI-8200 - Voice inverter card. The VI8200 enables the AR8200 to recover intelligible audio from certain types of analogue transmissions which would otherwise sound scrambled. They operate by splitting up the audio spectrum and "flipping" the upper and lower tones around a certain frequency point. The VI8200 enables 157 different "flip points" to be selected in the frequency range of 2.4kHz to 5.6kHz. SC-8200P - Soft Pouch type carry case. OS-8200 - "Open ended" option cable that can be used for a variety of projects. All this in a cabinet which weighs less than 200g (excluding NiCads & aerial) with dimensions of 61(W) x 143(H} x 39(D) mm (excluding projections). We will usually upload a suitable Automode bandplan (not effecting frequency coverage) for the country of use but this bandplan can be altered via AOR's software. We are also, at times able to supply a choice of AC voltage adapters and designs.